The NHS Knowledge Mobilisation Framework is designed to help individuals to develop and use skills to mobilise knowledge effectively in their organisations – to help them to learn before, during and after everything that they do so that pitfalls can be avoided and best practice replicated. It is a re-working of an original concept devised by what was the Department of Health Connecting for Health Knowledge Management Team and the Kent, Surrey and Sussex Library and Knowledge Services Team. The modules introduce eleven techniques to help plan, co-ordinate and implement knowledge mobilisation activities in your organisation. Accompanying the framework are a set of quick reference cards. If you would like further information about the programme or help with using any of the techniques described, please contact a regional library lead. At the beginning of a work activity, and accepting that individuals and teams bring a body of knowledge to a task, Learning Before is about considering what you know, what you don’t know and identifying strategies to plug knowledge gaps to get a piece of work off to the best possible start. This might mean searching for written or explicit knowledge such as tools and guidance; or, it could mean identifying and discussing with experts their insights and experiences or their tacit knowledge. Techniques presented in the framework can help an organisation or team to get started quickly and efficiently on a project or piece of work by giving them access to the learning and experiences of others who’ve undertaken the same work or something similar in the past. So this means they can avoid the pitfalls that have befallen others and they can benefit from the successes of others too – helping to get it right first time. Learning After is concerned with taking a pause to reflect on a work activity, and to capture, build – and ultimately share a knowledge base of a work area with those that would have an interest in it. That knowledge might be shared with immediate peers in different departments or organisations, or with successors. Learning During balances both Learning Before and Learning After activities: it is concerned with both new knowledge requirements as they emerge and packaging insight/experience to provide the foundation for the work that follows. Thank you to Caroline Storer, Knowledge Manager, NHS Digital; Andrew Lambe, Senior Knowledge and Intelligence Manager, NHS England and other members of the original project team for providing much of the material on which we have been able to build. Thanks also to our reference group for bringing their expertise and knowledge to the project team and to our volunteer library staff for testing, evaluating and informing the development of the modules. 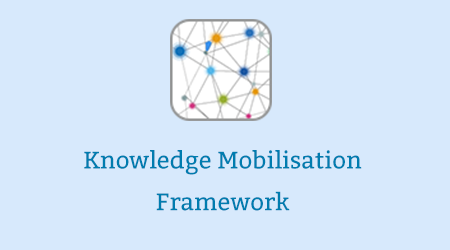 The Knowledge Mobilisation Framework programme is freely available to all, with no registration required. Should you require a record of your activity or a certificate of completion, you will need to register. If you do require evidence of completion, you will need to register for an e-LfH account, if you do not already have one. You can register by selecting the Register button below. If you already have an account with e-LfH, then you can enrol on to the Knowledge Mobilisation Framework programme by logging in to the e-LfH Hub, selecting My Account > Enrolment and selecting the programme. You can then access the programme immediately in the My e-Learning section. The Knowledge Mobilisation Framework programme is also available to NHS healthcare staff via the Electronic Staff Record (ESR). Accessing this e-Learning via ESR means that your completions will transfer with you throughout your NHS career.